InqScribe lets you create custom shortcuts and assign them to a keystroke (or "trigger") of your choosing. Although you're free to assign a shortcut to any combination of keys, you might run into issues using pre-existing triggers. In this article, we'll go through the "in use" triggers you should avoid as well as which triggers are generally available for assignment. What shortcuts are already in use? Existing system-wide hotkeys (e.g. print screen) may not be used. Avoid key combinations that are already mapped to menu items, like control-; or control-O. Such combinations will trigger both the menu item and the shortcut, which probably isn't what you want. Existing system-wide hotkeys (e.g. Exposé) may not be used. Avoid F1-F4. These are automatically mapped to Undo, Cut, Copy, and Paste. 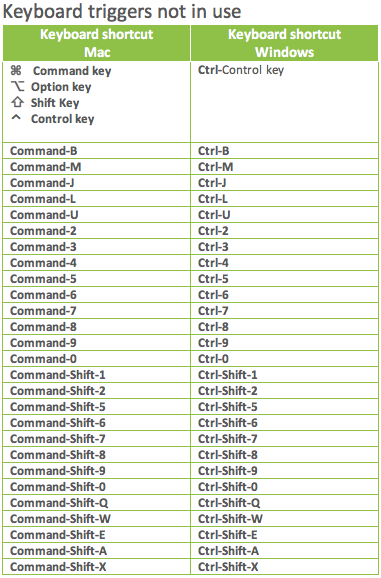 Avoid key combinations that are already mapped to menu items, like command-; or command-O. Such combinations will trigger both the menu item and the shortcut, which probably isn't what you want. Avoid key combinations that are used to enter accented characters (for example, option-u, option-e, option-a). These combinations are handled by the OS in a special way, and while InqScribe can detect them, InqScribe cannot prevent them from also being typed into your transcript. What keyboard triggers are not in use? There are many possibilities. If you use video editing programs such as Final Cut Pro or Avid, be sure to check out our blog article “Keyboard Shortcuts for Film Editors” on how to optimize shortcuts across your workflow. Which keyboard triggers do you use in your workflow? We welcome any feedback on the subject. 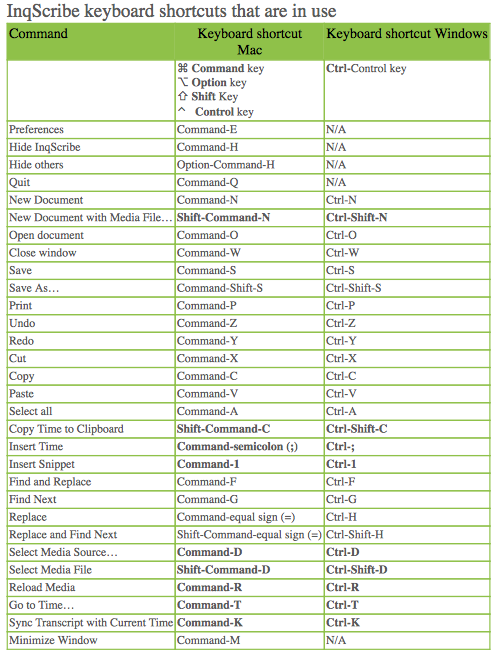 If you have suggestions for assigning keyboard shortcuts, please send an email to support@inqscribe.com.